Bilk is a neighborhood within Düsseldorf‘s City District 3, one of the most populated and active areas of the city. Bilk is served by a large and highly efficient transportation network (centered around the Düsseldorf-Bilk station), and is also home to the renowned Heinrich-Heine-University. The resulting student population injects a youthful, intellectual energy into the atmosphere of this hip neighborhood. To keep up with everything this bustling hub has to offer, check our list of the best things to do and see in Bilk, Düsseldorf. Alt Bilker Kirche, the Old Saint Martin Church, is both the oldest church and the oldest building in Düsseldorf. Built in the Carolingian time across two construction periods in the 12th and 13th centuries, it first functioned as a parish church serving the city’s locals as well as several neighboring communities. After Alt Bilker lost its status as a parish church in 1812, it remained abandoned and unused for over a century, and it suffered some structural damage during the war. However, thanks to a recent period of complex restoration work, Alt Bilker has reopened its doors to new congregations: today, the Catholic community of St. Boniface and the Evangelical Lutheran Church congregation of Düsseldorf both gather here for worship. The Rheinpark Bilk is a vast, verdant park that sprawls across a full 4 hectares, from the Kniebrücke Bridge to the Zollhafen. Beloved by locals and tourists alike, this park offers a gorgeous vantage point for admiring the banks of the Rhine with the city skyline standing tall in the background. This proximity to the Rhine is tied to the park’s history: in olden days, the Rheinpark was used as a harbor where ships navigating the Rhine River could set down anchor. When the harbor fell into disuse, the city saw an opportunity and transformed the space into the magnificent park you’ll see here today, with a lively variety of plant life and all kinds of trees dappling its paths, including poplars, limes, maples and ash trees. While strolling the park you may also notice three important structures that have cropped up here since the defunct harbor’s transformation: the Landtag, Düsseldorf’s parliament building; the Rheinturm, a strikingly tall telecommunications tower; and the studios of the regional broadcasting corporation WDR. With its piercing height of 240.5 meters, the Rheinturm (or Rhine Tower) is easily the tallest building in the city. 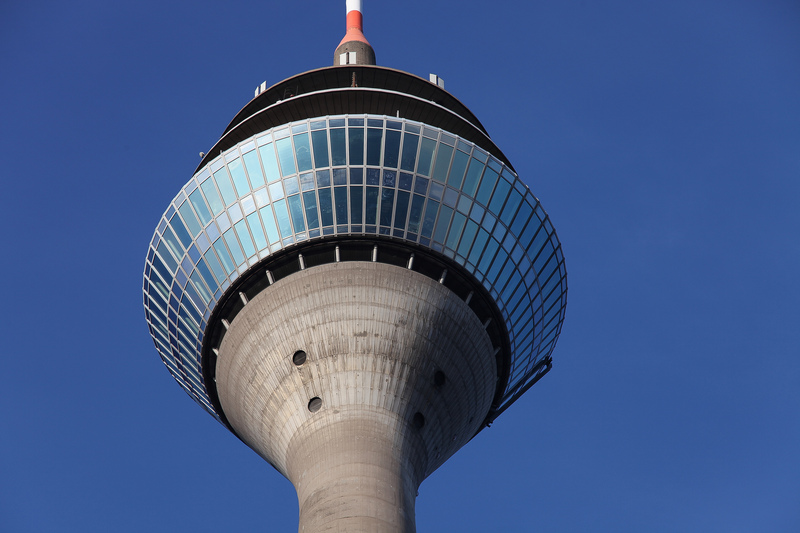 This concrete telecommunications tower carries aerials for directional radio, FM and TV transmitters to listeners all over Düsseldorf. Its construction began in 1979, and its quick completion was celebrated just two years later with an inauguration in 1981. About two thirds of the way up at an altitude of 170 meters, the Rheinturm hosts its own revolving restaurant and observation deck, where visitors to Bilk can enjoy stunning panoramic views of the whole city (and a great backdrop for photo ops). The tower’s impressive height isn’t the only record the Rheinturm broke: the Lichtzeitpegel, a light sculpture on the shaft of the tower built by Horst H. Baumann, is also recognized as the largest digital clock in the entire world. The Stadttor is a 20-story, 84-meter skyscraper built in 1998, which has served as the seat of the state-chancellery of the Prime ministers of North Rhine-Westphalia since 1999. Its name, which can be translated to ‘city gate’, refers to the fact that the Stadttor marks the Southern entrance of Rheinufertunnel. This is also reflected in its unusual parallelogram-shaped floor plan. The Stadttor has won many architecture awards for its innovative, intelligent design plan: 15 of its 20 stories constitute the atrium of the building, and its double-façades allow for natural ventilation even on the topmost floors. 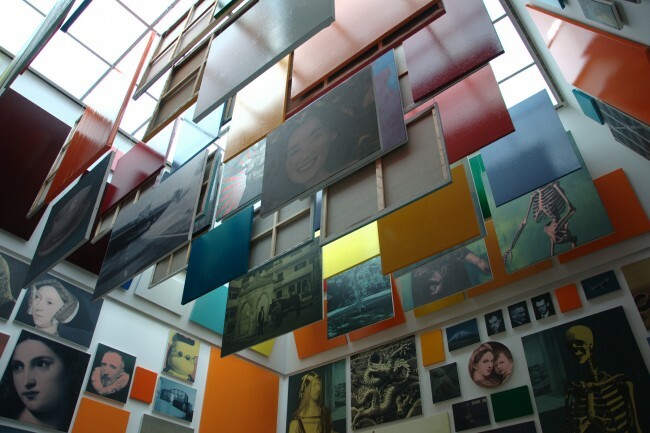 The Kunstsammlung Nordrhein-Westfalen is the art collection of the German Federal State of North Rhine-Westphalia. Founded in 1961, the Kunstsammlung is internationally renowned for its 20th century art collection, although recently the art gallery has expanded to include more recent pieces, which makes for a refreshingly eclectic viewing experience. The space is split into three exhibition venues: the K20 at Grabbeplatz, the K21 in the Ständehaus and the Schmela Haus. The Grabbeplatz (K20), inaugurated in 1986 and recently expanded in 2010, is well known for its sleek, curving façade of black granite; inside, it houses an auditorium and two separate foyers for special concerts, lectures and other events, with live performances often correlating to its collection of artwork. The main focus of the Kunstsammlung is classical modernism, and in its permanent collection you’ll find major works by Pablo Picasso, Henri Matisse, Piet Mondrian, and Paul Klee. There is also a collection dedicated to postwar American art, which includes works by Jackson Pollock and Frank Stella, and another collection that features Pop artists Robert Rauschenberg, Jasper Johns, and Andy Warhol. These are only a few examples of the amazing artwork that can be admired in this extensive gallery. Established in 1974, the Botanical Garden of Düsseldorf stretches over a total of 8 hectares and hosts roughly 6000 different species of plants (mostly fauna hailing from temperate climates), which are overseen and maintained by the University of Düsseldorf. The Botanical Garden is organized into a series of thematic gardens. Its geographic gardens each focus on the plant life of a specific region of the planet, such as Central Europe, Caucasus, Northeast Asia, Japan, China, North America, and South America. There are also the ecological gardens, where you’ll find a picturesque collection of heath, moor, pine forest, fruit trees, and wild flowers. The Botanical Garden also features a medicinal garden, a cottage garden, a selection of summer flowers, and special standouts like plants of volcanic soils, endangered species, and carnivorous plants. Before you leave, be sure to check out their glorious greenhouse complex. Neuer Zollhof or Der Neue Zollhof (The New Zollhof) is a complex of curious-looking buildings designed by American architect Frank Gehry. The complex is formed by three separate structures, which were completed in 1998. 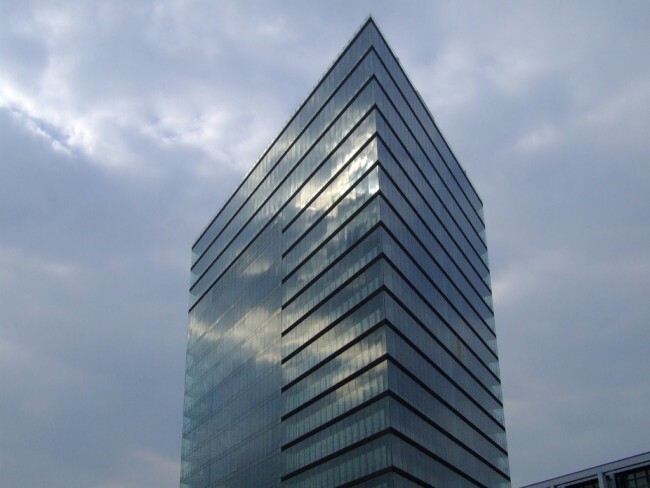 The most remarkable characteristic of the Neuer Zollhof’s design is the curved, lean floors and façades, which gives the buildings a fluid quality and creates an impression of leaning towers. Each building has a different façade cladding: the outer two in white plaster and red brick, the middle structure in stainless steel that deliberately reflects its sister structures on either side. The tallest building is made of a total of 14 stories and it is just under 50m tall. 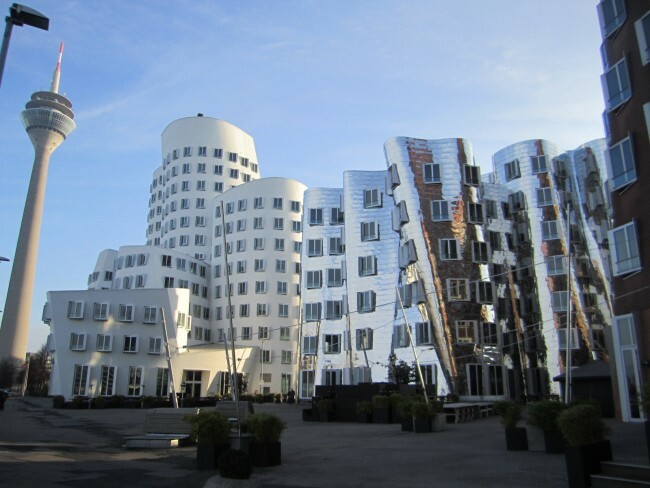 The Neuer Zollhof is a world-famous wonder of modern architecture and design, and attracts a great deal of admiring tourist attention in Düsseldorf.